Scones are one of my favorite coffee-shop treats! I love to enjoy a good scone with my latte, especially a fruity version like this one. White chocolate raspberry scones – buttery, tender cookies pair perfectly with a cup of coffee in the morning or tea in the afternoon. 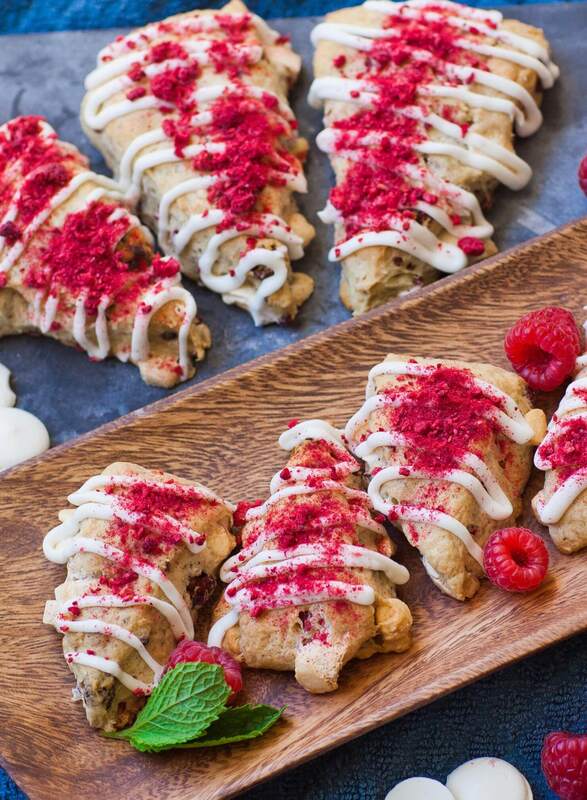 These white chocolate scones with freeze-dried raspberries are loaded with berry flavor and a light touch of cinnamon! I finish them with a simple sugar glaze and more raspberries on top for extra flavor. Plus, these are easy to make and store great so you can enjoy them all week long! I use freeze-dried raspberries in this recipe to add maximum berry flavor without adding extra moisture. Fresh raspberries are super juicy and will also work in a pinch of you don’t have freeze-dried berries. Just keep in mind the berries will release juices while baking. I get my berries at Trader Joe’s. Head over to my blog shop to find them online on Amazon. And, use some of those freeze-dried raspberries to garnish the top! Their bright color looks incredible! Watch my video recipe for all the sweet details! Enjoyed these raspberry scones? Please share and save it to Pinterest! Combine the dry ingredients first in a food processor: flour, sugar, baking soda, baking powder, salt and cinnamon. Pulse for a few seconds until well combined. Add the butter. I recommend cubing the butter beforehand and placing into the freezer for 15 minutes to ensure it's very cold. Pulse the butter and dry ingredients together into a fine crumble. Transfer the butter and flour mixture into a large bowl. Make a well in the center and add the egg, sour cream and vanilla. Combine all of the ingredients together to form a sticky dough. Sprinkle work surface lightly with flour, then transfer the dough. Knead the dough together with lightly floured hands. Using your hands, spread the dough into a small square and add the freeze dried raspberries and white chocolate. Fold the dough over and knead the fillings into the mixture. Transfer the dough onto a baking sheet lined with parchment paper and shape the dough into a large, flat disk; about 1 1/2 inches tall. Using a sharp knife, section the dough into slices. Separate the pieces, leaving a little space between each scone. Refrigerate the scones on the baking sheet for 30 to 45 minutes. Meanwhile, preheat oven to 375F. Once scones have chilled, bake in preheated oven for about 25 minutes, or until edges are golden brown. Remove from oven and let the scones cool on the baking sheet. Once cooled slightly, transfer them onto a wire rack to cool completely. While scones are cooling, prepare the sugar glaze. Combine the confectioner's sugar and heavy cream in a small bowl and whisk until smooth. Transfer the glaze into a disposable pastry bag or ziplock bag. Drizzle the glaze over the scones. If desired, garnish the top with crushed freeze-dried raspberries while glaze is still wet. Keep scones covered and at room temperature. You can easily make this recipe without a food processor. You can cut the cold butter into the dry ingredients using a pastry cutter or two forks. Hi tatyana, is freeze dried raspberries the same as frozen raspberies (the ones in the supermarkets)?